One day, the world ended–so we built a new one. Everything on Earth, even gravity itself, is now powered by endlessly intricate clockwork. 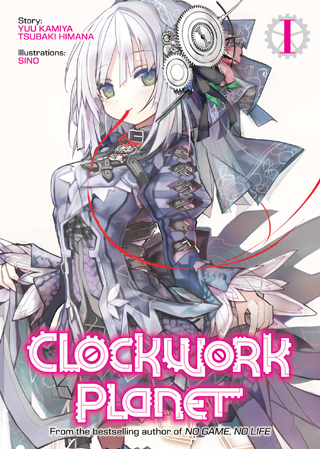 Young machine-lover Naoto Miura dreams of becoming a master clocksmith, working with the wonders of this artificial planet. When one of those wonders comes crashing right through his ceiling, he gets more than he bargained for. Armed with a supernatural sense of hearing and a beautiful robotic ally, Naoto just might be the best hope to unravel a conspiracy threatening millions of lives. From the bestselling author of No Game, No Life!